Boiler and heating appliance manufacturer Ferroli has appointed Craig Worth and Paul Megginson as Divisional Sales Managers to lead the company’s UK domestic sales force. 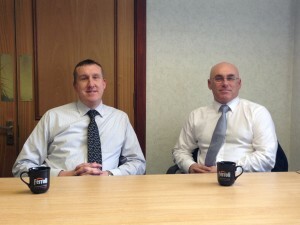 Craig and Paul, who have both been with Ferroli since 2011, bring with them a lifetime’s experience of the plumbing & heating industry, both in the merchant and manufacturing sectors. Craig joined Ferroli from Remeha where he was divisional sales manager, prior to working with Mira Showers, Glow-worm, PTS and Travis Perkins. Paul, who also joined Ferroli in 2011, began his career as a plumbing & heating engineer before working in the independent merchant sector as a branch manager and then moving on to become a divisional sales manager with Remeha. The focus of Ferroli’s domestic sales drive in 2013 continues to be the remarkable Modena HE boiler, which is impressing installers with its superb performance, reliability record, ease of use and affordable price.